Open letter to the word "gift" used as a verb. Nope. You are a noun. As in, "My mother gave me a gift on my birthday. It was a fluffy new scarf!" Or "Here's a gift! It's for your birthday! It's a fluffy new scarf!" Or even, metaphorically, "My gift is the ability to be catankerous about practically anything." But not: "I plan to gift him with a fluffy scarf." Or "He gifted me with a bucket of crawdads." (No! Not remotely!) "Why don't you gift your best friend with a fluffy new song?" (Yes! By all means) "Why don't you give your best friend a song-y new fluff?" Don't you even, the word "gift" used as a verb. Just quit it. You make me want to stop giving people fluffy new stuff altogether. And someone gifted you a cold? That is truly wrong. You're the gift that keeps on giving the whole year through, HT. May you be back to your song-y and fluffy self in no time. What she said! You are pretty song-y and fluffy even when you're sick with a cold. But we still hope you get better fast. 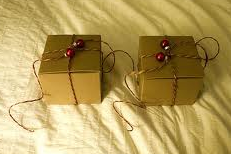 I would like you to gift me my song fluff gift wrapped please.